[audio mp3="http://carvalko.com/wp-content/uploads/2018/11/DIANEVIBES3.mp3"][/audio] "Diane" I'm in heaven when I see you smile Smile for me, my Diane And though everything's dark, all the while I can see you, DianeYou have lighted the road leading home Pray for me (my Diane) when you can (my Diane) But no matter wherever I roam Smile for me, my Diane(Smile for me, my Diane)But no matter wherever I may roam (wherever I roam) Smile for me, my Diane..
A few weeks ago, I, Jonathan Marcantoni, Editorial Trance, was turned on to poetry collection Detrás del Acero by Joe Carvalko. His book examines life in 20th century America, placing special emphasis on the working class and the evolving relationship racial minorities have had with the greater society over that time. The book is both socially conscious and personal, as Mr. Carvalko uses aspects of his own life, his family history and his wife’s culture to influence his poetry. The language in his book is simple yet dense with emotion and ideas. The work has a haunting effect on the reader, wi..
It’s past midnight and I have put the pen down to scan the four framed pictures hung over my desk—, two abstract, colorful geometric figures; two portray boxers with an uncertain fate. I wonder why I chose to hang them where I spend most days and nights. (more…)..
My granddaughter sat next to me at the piano waiting to start her first lesson. On the rack in front of us, the music for “Some Enchanted Evening,” stared back, which, but for Amy’s question, “Poppie, when did you learn to play the piano?” would have been unremarkable. When I didn’t respond, she insisted, “Poppie, who . . .?” “My aunt played and she showed me. Now, you know your alphabet, so let’s start there.” Amy wasn’t finished. “Does she still play?” “I don’t think so….” “Why?” “Well, I don’t know.” Sometimes we hide the truth because, as in this case, my student needed to hear the harmoni.. "...Someday, only remnants of the Homo sapiens will remain. Some predict not beyond the twenty-fourth century. By then what was once a life form that tracked its origins back 2.5 million years, will have completely disappeared." 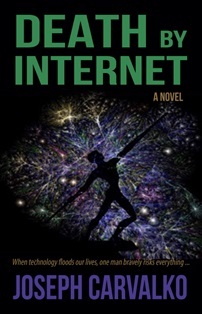 (more…)..
DEATH BY INTERNET Carvalko takes the reader to the outer edge of technology and ethics in a speculative fiction that evokes the bizarre power of the Internet to reveal if the world is merciful. A fitting topic in light of contemporary America, with its frequent violent episodes and inadequate political responses. Strapped down and dying in a prison cell, Sam Mariani tells the story of how he searched for an objective "good," inviting the public to respond to his blog, but rather than click the familiar “Like” button as on Facebook, they voted to either “Die” or “Live”, depending on whether the..